RZR Half Windshield / Wind Deflector Fits: 2014-17 RZR XP1000, 2014-2017 XP1000-4, 2015-17 RZR 900, 2015-17 RZR 900-4 and 2016-17 RZR 1000-S. Made from 3/16" Thick Hard Coated Polycarbonate (not cheap acrylic). Attaches with our patent pending rubber "Fast Straps". Rubber mounting straps will not rust or rattle. Bottom seal protects your hood. EMP Logo etched in bottom drivers side (not shown). Made from 3/16" thick hard coated Polycarbonate. It is hard coated on both sides. Not only is the hard coating abrasion resistant it is also UV resistant. 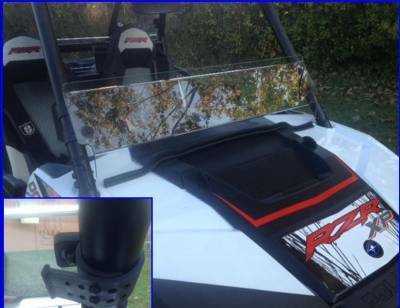 This is probably the last windshield you will ever buy for your RZR XP1000. It features our "Fast Straps" so you can easily remove it without any tools. Simply unhook the rubber straps. Rubber straps will not scratch your cage. DOT rated and stamped.